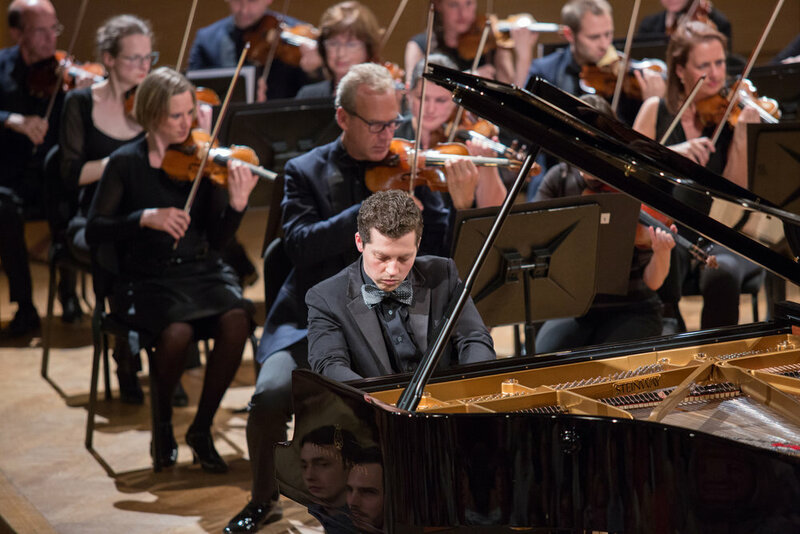 The winner of the Second Prize at the 2016 Queen Elisabeth Competition and a recipient of a 2019 Avery Fisher Career Grant, pianist Henry Kramer is establishing himself as one of the most exciting American musicians of his generation. His performances have been praised by critics as “triumphant” and “thrilling” (The New York Times), and “technically effortless” (La Presse, Montreal). Henry has been invited to play with orchestras across the globe including the National Belgian Orchestra, Brussels Philharmonic, Calgary Philharmonic, Shanghai Philharmonic, Bilkent Symphony Orchestra in Ankara, Turkey, the Portland (Maine) Symphony Orchestra, the Orchestre Métropolitain du Montreal, and the Yale Philharmonia. He has soloed under the batons of preeminent conductors Marin Alsop, Jan Pascal Tortelier, and Stéphane Dénève. Henry holds both a Master’s and a Bachelor’s degree from The Juilliard School, where he received the 2015 William Petschek Recital Debut Award, and an Artist Diploma from the Yale School of Music, where he received the Charles S. Miller Prize for the most outstanding first-year pianist. In 2018, he earned his Doctorate of Musical Arts from the Yale School of Music. Dr. Kramer currently holds the L. Rexford Whiddon Distinguished Chair in Piano at the Schwob School of Music at Columbus State University in Columbus, Georgia. Henry Receives 2019 Avery Fisher Career Grant! February 8, 2019 set as release date for Matthew Lipman and Henry's Debut Album on Cedille Records! Replay of Matthew Lipman and Henry's Art of the Recital Performance at Chamber Music Society of Lincoln Center! Review of Matthew Lipman and Henry's Recital at Chamber Music Society of Lincoln Center!